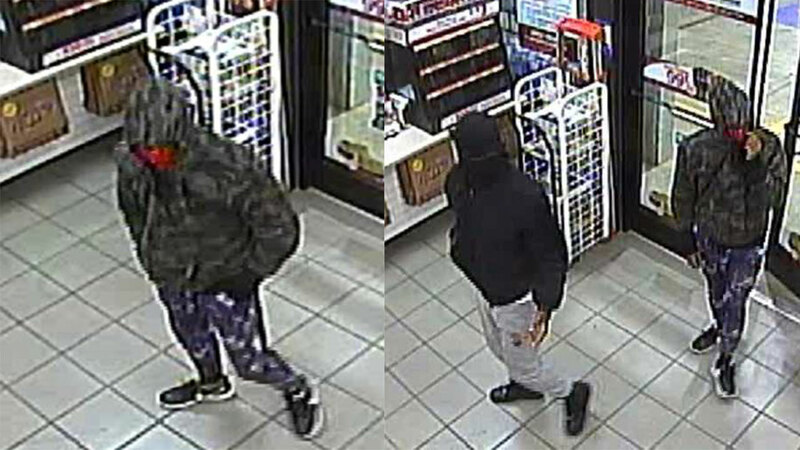 CALYTON, North Carolina (WTVD) -- The Clayton Police Department is searching for two men who robbed the Speedway gas station located at 8060 US-70 Business West near Powhatan Road on Saturday. Authorities said that at about 1 a.m the two men walked in through the front door wearing hoods and face masks. One man was carrying a handgun, possibly a BB gun since the clerk described it has an orange tip. They asked the cashier to open the cash drawer and then took away with money. The cashier was unharmed and managed to call 911 after the robbery. Police describe the first man as a black male in his mid to late 20's, 5'10 to 6' tall of medium build. He was wearing a black hoodie, grey pajama pants, black shoes, a black mask (similar to ski mask), and held a handgun. If anyone saw anything in that area around 1 a.m. or recognizes these two men, please call Det. Colonel Kilpatrick at 919-553-4611.